When I introduced myself yesterday, a number of you expressed interest in my admittedly stylish Dark Souls hoodie. With the sigil and color scheme of the lovable character Solaire emblazoned on it, it's one of my most prized possessions. But if you're a Dark Souls fan hoping to get one for yourself, I've got some bad news: it's no longer available for sale. But that doesn't mean it never will be again. I reached out to the hoodie's creator, Josh Hansen, to find out whether he'll be making another run, and his answer was sufficiently ambiguous enough for me to believe that he just might. The sweatshirt's design was something of a collaborative effort across the Dark Souls subreddit. "It was very organic," Hansen said. Once the design was finalized, Hansen had the hoodie made for cheap through connections at clothing manufacturer the Independent Trading Company. Hansen originally sold the Solaire hoodie in two limited runs, and only a few hundred were ever produced. The entire process, from design to sale, took around eight months. It was a significant risk to have them made in the first place, Hansen told me, as he didn't take orders in advance, and he sold the garments at cost, his only profit coming from a few paltry donations. After all the hassle (the hoodies arrived to him around the same time his wife was due to give birth), he's hesitant to do another run. But he said if he did, he'd do it through Kickstarter or another crowdfunding site in order to make it easier. I asked him if he'd be worried about attracting the ire of Namco Bandai and From Software, who haven't sanctioned his use of the Dark Souls imagery. On the contrary, he said, "If someone from Namco Bandai or From is not aware of the hoodie already, I'd be incredibly surprised." Besides, it's not like they seem to mind any of the other unofficial Dark Souls apparel floating around on the internet. Are You Hard Enough To Wear Dark Souls On Your Chest? 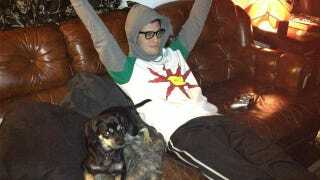 I wear my Solaire hoodie almost every day. It's the most comfortable sun-praising apparel I own, and I legitimately believe that it makes me better at the game. Don't give up hope if you want to get your own—I can't be sure, but it might even help if you show Hansen a little love on Twitter. Maybe you can convince him that another run will be worth his time and effort.